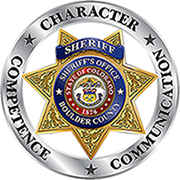 Boulder County / Safety & Law / Victim & Witness Support / Restorative Justice / Does it matter What I Want? A Sheriff’s Deputy may have given you one of our program cards and/or brochures. Feel free to call us anytime ( 303-441-1752) to talk about what happened. If we don’t hear from you first, we’ll be in touch by phone to start the process, answer any questions you might have, and to schedule the conference date and time. We will make every effort to schedule a day and time that is convenient for you. After a date is confirmed for the conference, your case will be assigned to two volunteer restorative justice facilitators who will contact you to set up a preliminary meeting- a meeting that will be held before the restorative justice conference. There, we’ll ask about what happened, how it’s affected you, what you need or want, and we’ll explain the restorative justice process in more detail. You will have a chance to say whether you want to participate personally, have a representative participate for you, write a statement to be read at the conference, or if you wish not to meet with the offender(s) but remain informed. You may also ask for a victim advocate to be present with you. The facilitators will also hold a separate preliminary meeting with the offender. The conference is the first time you will have a chance to meet with the offender, the deputy or other law enforcement personnel, members of the community, and others affected by the incident- with the facilitators directing the process. The facilitators will offer a safe space for a respectful discussion of harms, need and repair. Restorative justice allows you to have a voice in the process and to work collaboratively towards creating a contract for the offender.